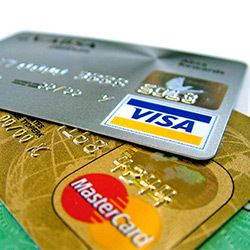 Credit card companies must stop profiting from disaster. Credit card companies siphon off upwards of 3% of all charitable donations as so-called "transaction fees." While 3% may not sound like much, it adds up quickly. The Huffington Post recently reported that "credit card companies and banks make as much as $250 million each and every year from these fees, a number that increases greatly in times of crisis." This is an unconscionable amount of money to take away, money that is vital for relief and development across the globe. The major credit card companies — Visa, MasterCard, Discover, and American Express — responded to public outcry against this practice after the 2010 earthquake in Haiti with half-measures and smoke and mirrors. They chose a very small group of charities which would be exempt from those fees for a very limited amount of time. Donations sent to help respected organizations in Haiti — such as those to Partners in Health, Doctors Without Borders, and Mercy Corps — were still subject to excessive and amoral fees. There is no reason to believe that, without pressure from customers, these companies will cease charging for charitable transactions of their own accord. Send a strong message to Visa, MasterCard, & other major credit card companies: Every penny of a charitable donation must reach the people who need it most. Waive all transaction fees, for all charitable donations, for all time. Sign below! I am outraged to discover that for each charitable donation I make with my credit card, your company takes up to 3% for "transaction fees". The $250 million that your companies receive annually through these fees alone are intended for people in need, particularly in times of crisis. Put 100% of donations in the hands of the people and groups intended to get it. Waive all fees, for all donations to legally recognized charities, for all time. Listen to your customers — it's time to stop profiting from suffering. That's 30,040 signatures! Let's keep the ball rolling.